I’ve been getting into my board games a bit more recently. Board games are fun… they’re like videogames, just without the load times, and they come in as just as many varieties as well. Everything is much more immediate and personal with all the players sitting in front of you, which is why Strategy-based board games especially I find a lot of fun. I played a few growing up – some of the standard ‘kiddy’ fairs (Mouse Trap, Hungry Hippos, that kind of thing…), but also more complex ones Stratego (and later, Stratego4), RISK, Cluedo… this game my granddad had about escaping from a German castle… we even had a board game called Jeu D’affairs which was basically a game about corporate management and making money… although we were a bit young at the time to really ‘get’ it, so we kind of made up our own rules. Shame mum can’t find it anymore, would have liked to give it a go now that I’m not such a noob. There’s a group of guys who live just down the road from me that I’ve become friends with who like their board games, so I’ve been playing with them. It’s actually kind of refreshing to have a large group of people to share a hobby with: Even when it came to videogames, I was usually the only person I knew who liked what I liked. Even though I’d go round a mate’s house every Saturday to hang out, we usually ended up playing Tekken (which I wasn’t good at) or Worms (which everyone ganged up on me for). The rise of the internet has also kind of taken something out of gaming, so despite having loads of friends (and fellow writers) that also enjoy that, it doesn’t quite feel the same. Having a bunch of guys all sitting in the living room though, drinking beer and having a round of Battlestar Galactica: The Board Game or RISK is great fun though. 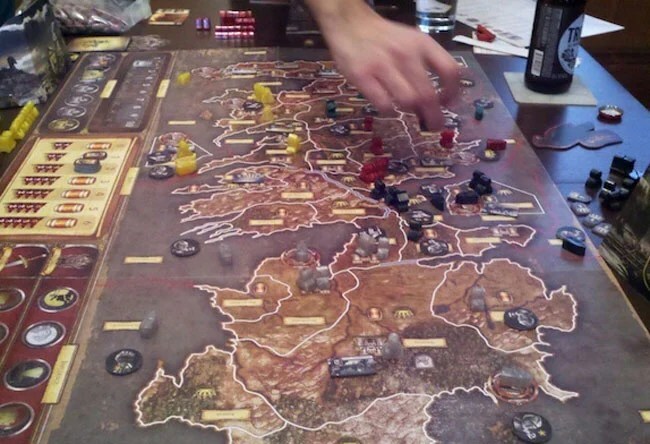 What we’ve been playing a lot recently is A Game of Thrones: The Board Game (Second edition) – basically like RISK but with a load more rules. It’s an interesting one – there are up to six houses that can be played with depending on how many people you have – The Starks, The Lannisters, The Greyjoys, The Baratheons, The Tyrells and the Martells. It’s officially for three to six players, but we’ve played a game of four and a couple games of five and it’s a bit imbalanced with less people, purely due to starting conditions. The less players you have, the more factions are taken out (starting from the south and working up) and replaced with these ‘Neutral Forces’ tokens to stop people steamrolling through the map… except in most cases they aren’t that hard to overcome, so whoever is closest to those areas basically steam-rolls through the map. It allows for a relatively easy victory if the other plays aren’t paying attention. The Martells in Dorne have the Tyrells in front of them in Hightower should they want to expand into the southern areas of Westeros, and they also have the Baratheons (one of two island based factions) to contend with should they decide to sail south from Dragonstone. The Tyrell’s have the Martells, obviously, but also the Lannisters to north, making expansion tricky. The Baratheons have it the easiest, as they don’t have any ‘direct’ rivals but depending on where they choose to expand, they will eventually run into someone, possibly several someone’s all at once. The Lannisters have to contend with the Tyrells from the south, but also the Greyjoys attacking by sea from the Iron Islands just off the shore to the east. The Greyjoys (the other island-based faction) probably have it the hardest, as there’s not a hell of a lot of room to grow until they come into contact with both the Starks and the Lannisters. The Starks probably have it second easiest as they only really have to contend with the Greyjoys as an immediate threat, although since they start in the weakest position almost, if they lose the initiative it could cost them as they will have little where else to go. Seems a bit complex already, doesn’t it? You haven’t even read the rules yet… there’s a lot to take in at once as to what can do what, and where, etc… but once you know the rules, and apply that to your strategy, the game actually progresses relatively quickly. Usually. Seeing as in I’m still struggling to find things to talk about on this here blog-thing, I might follow this board game thread a bit more, talk about various games I’ve had or something… maybe even put up some ‘guides’ (from my perspective) on how to play as the various houses. We’ll see. Hope you’re all enjoying your VITA’s by the way. Have to say, I’m tempted, but I’m not that much of a handheld gamer that I’m willing to spend all that money on everything. I’m happy scrounging the odd game for my DS at the moment. Yeah, let’s gloss over the fact that I’ve pretty much failed in my resolution to keep up with this blog better. I’m here now, that’s all that matters. Interesting story cropped up today in the form of Double Fine Productions, a popular studio behind games like Psychonauts, Costume Quest and other downloadable arcade titles. Have to say they don’t do much for me personally, but the studio’s founder – Tim Schafer – is a well-known figure within the industry who worked at Lucas Art’s game company on games like The Adventures of Monkey Island and Grim Fandango, before founding his new company at the turn of the millennium. Anyway – Double Fine have been in the news today because they are one of the first fairly major studios who have fully crowd funded a project, in this case a new ‘modern’ point & click adventure game they want to make but can’t get any funding for from any of the big publishers. Kickstarter is a well-known website for trying to get public funding, and whilst a couple of companies have tried in the past, none it seems have really succeeded until now. The most remarkable thing is, as you can probably see by going to the link, the company had already raised their target of $400,000 after eight hours… with 33 DAYS still left on the clock. At the time of writing, they’ve raised nearly $960,000. Congratulations are in order, I suppose. Point & Clicks again aren’t my cup of tea so I can’t say I’m that excited for the game itself, but it is a fascinating occurrence none-the-less, will be interesting to see how much they get in the end, as well as what the game will actually be like. Several things to consider though – due to the nature of how the donation system works on Kickstarter, many of the people who would have bought this game, already have due to the fact that they donated (donators get it for free, and there are more perks available the more you donate). At worst (assuming they don’t overspend), it could mean the Double Fine break even, but whether that’s even a good thing or not is anyone’s guess… we’ll just have to see. I imagine publishers wouldn’t fund the project because they didn’t think any money could be made, and if Double Fine break even, or don’t sell enough to turn any significant profit, then in a way those same publishers will have been proven right – regardless of whether the money came from the internet or the publishers themselves, breaking even is breaking even. At best, Double Fine might get a pat on the back for managing without any help, but we’ll essentially be back at square one as far as developer/publisher relations go. Indeed, this could all just make things worse – with a proven test case about how a studio can fund itself, publishers might turn around and say “well if you don’t like it, go find your own money”. Still, it’s a fascinating example, of what studios can do by themselves, of the power of ‘the crowd’. Much like ‘The Cloud’, ‘Crowdwhatever-ing’ is becoming the new it-term in the world of internet and computing. As someone who likes to watch the world evolve around him, I’m interested in seeing where this is going, although unlike some of my peers, I don’t really see this as the second coming of Christ or something. Even though they seem a little bit too excited about Double Fine’s situation, Johnny Cullen (VG247) and John Walker‘s (Rock,Paper,Shotgun) opinion on this matter is worth a read. Oh, and Double Fine seem to have broken some kind of record now.